I just finished up teaching the “Power of the Mind in Healing” class. We met for four Saturdays in February. 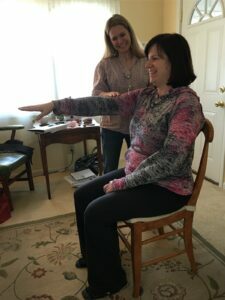 I had the pleasure of teaching two occupational therapists who have been practicing for nearly 20 years. In fact, they were in the graduating class right after me at St. Kate’s. We covered topics on the foundations of Holistic/Integrative Health Care, the Mind-Body-Spirit, meditation, relaxation, spirituality, and intuition. They loved it! Here they are practicing muscle energy testing. This is different than testing muscle strength. It assesses the body’s wisdom about if something is good for you or not, and can answer “yes” and “no” questions. Examples of what they tested were dairy, gluten and coffee. If it is good for your energy, the arm will stay strong. If it’s not, it will go weak. 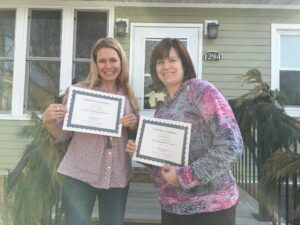 They shared two very nice testimonials about the class. One even suggested that this class should be taught in all OT schools. I agree! Thank you Kari and Amanda! Congratulations on completing the class! I’m sure you will help many with your new Holistic Mind-Body-Spirit knowledge.